By Milton V. Backman, Jr. The Kirtland experience, spanning much of the 1830s, is too vast and too varied to explain in a succinct statement. We can say, however, that this was a time of paradox: it was a period of great growth in membership, but also a period of crippling apostasy; it saw the successful building of a temple, yet also severe economic depression; it was a time of unparalleled spiritual manifestations, but also a time of great persecution. We can safely say that the Kirtland years, perhaps much like our present period, brought rapid and profound change﻿—change that has had lasting impact. A corollary to change is often sacrifice, and sacrifice was an important characteristic of the Kirtland era. Latter-day Saints have always been challenged to give of their time and substance for the kingdom, but in the 1830s unusually demanding sacrifices were required of the Saints. Many early converts were called by revelation to gather in Ohio. At the call of the Prophet, they sold homes and farms and migrated west. They were then asked to sacrifice again by giving to the poor and contributing to various Church programs. At a time when they were few in numbers and material goods, members were called by revelation to build a temple for the Lord. While this building was under construction, brethren living in the eastern states were commanded to leave their families and march nine hundred miles to western Missouri to aid in the work there. Non-Mormons could not comprehend why Latter-day Saints were willing to make such a variety of sacrifices, and they denounced them for their actions. These critics did not realize that the converts of the Church were motivated by a new spiritual force: the revelations recorded by a modern-day prophet of God and the Holy Ghost which testified to the new members concerning these revelations. Throughout the 1830s Joseph Smith unfolded principles which influenced not only beliefs, but also daily behavior. Members were challenged to incorporate these concepts into their lives. Many of these converts had joined the Church shortly after meeting itinerant missionaries who were new converts themselves. At their baptism these early members understood only a few basic principles of the gospel. But while many members were initially shallow in doctrinal understanding, they were blessed with the constant flow of revelation recorded during the 1830s. 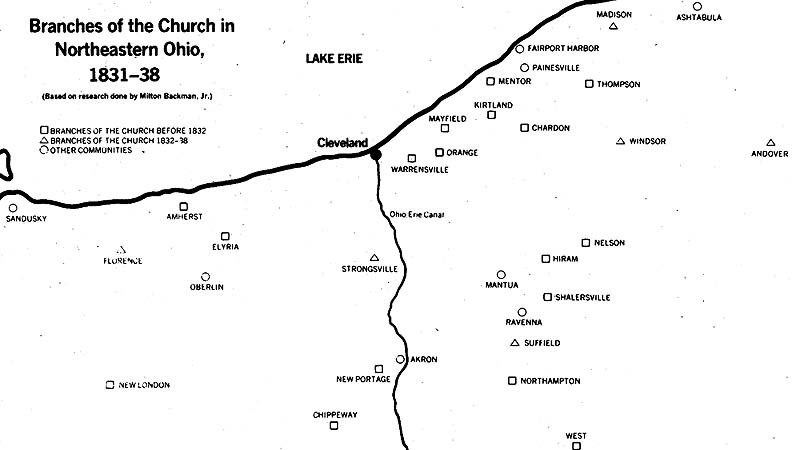 Almost half of the 136 revealed sections or revelations currently included in the Doctrine and Covenants were recorded in Ohio. Members also learned doctrine while attending school in Kirtland and while listening to the Prophet Joseph and other leaders during Sabbath and week-day meetings. Some doctrines were initially disclosed by the Prophet during private conversations and then told to others by his associates. A multiplicity of themes was included in the revelations constantly being unfolded by the Prophet to the new members of the Church. In some instances the revelations confirmed contemporary Christian conduct. Members were instructed that pride, selfishness, idleness, dishonesty, stealing, killing, and sexual perversions were transgressions. They were told to observe the Sabbath and the laws of the land. In other instances, principles were revealed that were not emphasized by most ministers. Every member had the responsibility of teaching the gospel to others, and men of the priesthood were directed to serve as traveling elders, preaching from community to community and from house to house. Members were instructed to become acquainted with good books and to study history, geography, languages, and many other disciplines. A number of revelations emphasized that members had a responsibility to impart their substance to the poor and to consecrate material goods and talents for the building of God’s kingdom. Members were also told to magnify their callings and to be “anxiously engaged” in righteous causes. While members were gaining an increased understanding of their responsibilities and of the future rewards that awaited the righteous, they were given the Word of Wisdom. In an age when a great many adults in America used tobacco and drank alcoholic beverages, tea, or coffee, Latter-day Saints were challenged to abandon these unhealthy habits. Many early members also found that they had to change some of their preconceptions regarding the role and conduct of a prophet. Before joining the Church, the only acquaintance that converts generally had with prophets was through the Bible; and in the view of some, Joseph Smith appeared and acted in a manner very different from the ancient men of God. Joseph Smith did not have a long flowing beard and did not wear a long robe. Instead, he looked like his contemporaries. While laboring in the fields he wore the work clothes of his age; he played with his children; he wrestled with the strongest men in the community; and he joked with his friends. He was a man with imperfections but he was also a prophet who recorded the word of God, and some early members found this difficult to reconcile. When some members claimed to have received revelations about Church affairs, Joseph had to inform them that he alone had the authority to receive such messages. Some early converts had difficulty accepting this restriction from a person who sometimes seemed so human, and yet had spiritual authority for the Church. Several Saints observed that six months after many members had communed with the hosts of heaven, the Spirit of the Lord was partially withdrawn from them. Daniel Tyler wrote in his autobiography that after a group of priesthood holders had received what we now know as part of the endowment, Joseph Smith cautioned them, saying: “Brethren, for some time Satan has not had power to tempt you. Some have thought that there would be no more temptation. But the opposite will come; and unless you draw near to the Lord you will be overcome and apostatize.”4 Six months after this warning had been issued, three apostles were disfellowshipped, and within one year three of the original seven presidents of the seventies had been released. Before two years had passed, eight of the twenty-five General Authorities who had witnessed some of the most remarkable events in the history of the Church had been excommunicated. Following the completion of the Kirtland Temple, the Saints were plagued with two serious problems﻿—poverty and unemployment. For three years (1833–36) many members in Kirtland had pooled their money and resources to build the Lord’s house. Many had given almost all of their material wealth for the construction of this building. Instead of buying property for themselves, many Saints settled on farms which had been bought by leaders of the Church and there they erected small log and frame houses. For three years missionaries had secured contributions from members throughout the Church to aid in this temple project. When the temple builders needed assistance, they turned to the Church and drew supplies from the bishop’s storehouse, the Newel K. Whitney store. While the economic distress of the Saints was aggravated by the collapse of the Kirtland Safety Society and the Panic of 1837, persecution of Latter-day Saints intensified. Members of the Church had been threatened by others; and while Joseph Smith was living in Hiram, he and Sidney Rigdon had been brutally beaten and tarred and feathered by an angry mob. (See History of the Church, 1:261–65.) During the construction of the temple, members had to guard the building at night.6 Then, amidst intensified apostate mobocracy, Joseph Smith fled Kirtland early in 1838. (See History of the Church, 2:529; 3:1.) Shortly thereafter other Latter-day Saints were warned of an imminent attack if they did not abandon their homes. As in Clay County in 1836 and later in Nauvoo (1846), members left Kirtland because they were forced to. In 1838 much of the Church membership in the Kirtland area (which had grown from about 150 in 1833 to approximately 2000 in 1837) headed west towards Missouri. Only 200 Saints remained for a few years within the shadows of the recently completed temple, after which many of them migrated to Nauvoo. Today, members encounter some of the same challenges experienced by the Kirtland Saints. We sacrifice financially by supporting missionaries and by contributing to building projects and other Church programs. With the current growth and expansion of the Church, more and more converts are being called to positions of responsibility. Like the Kirtland Saints, members are currently challenged to learn their duties and magnify their callings. In this contemporary world of rapid change, Latter-day Saints are also constantly challenged to endorse new policies and programs of the Church. As in the 1830s, individuals today have the responsibility of gaining a witness of the reality of the Restoration and of learning to harmonize their pattern of conduct with the inspired teachings of the living prophets. Truman Coe, “Mormonism” The Ohio Observer (Hudson), 11 Aug. 1836, pp. 1–2; N. B. Lundwall, comp., A Compilation Containing the Lectures on Faith, Salt Lake City: Bookcraft, n.d., p 48. See also remarks of Zebedee Coltrin in High Priests Records of Spanish Fork, Utah, Sept. 1880, Church Archives; Salt Lake School of the Prophets Minutes, Church Archives, 3 Oct. 1883, p. 59. William Hyde, “The Private Journal of William Hyde,” typescript, Brigham Young University, Special Collections, p. 7. Benjamin Brown, Testimonies of the Truth, Liverpool: S. W. Richards, 1853, pp. 10–11. Daniel Tyler, “Incidents of Experience,” Scraps of Biography. Tenth Book of the Faith-Promoting Series, Salt Lake City: Juvenile Instructor Office, 1883, pp. 32–33. For additional information on Mormon economy in Kirtland, see Marvin S. Hill, C. Keith Rooker, and Larry T. Wimmer, “The Kirtland Economy Revisited: A Market Critique of Sectarian Economics,” Brigham Young University Studies 17 (Summer 1977): 391–95. “Elder Kimball’s Journal,” Times and Seasons 6 (15, Jan. 1845): 771; History of the Church, 2:2. Milton V. Backman, Jr., a professor of Church history and doctrine at Brigham Young University, teaches the Gospel Doctrine course in the Edgemont Ninth Ward, Provo Utah Edgemont Stake.